Late one the afternoon, on the way home from school, my son took hold of my hand and started talking softly. He spoke so quietly, I could tell this was going to be more than the usual chat about our day. “I got kicked in the back at recess mom. It hurt.” he said looking to the ground. As I took in my son’s words, I noticed he was smiling. It wasn’t a mischievous or a nervous smile. Rather a sweet, trusting and hopeful smile. Our eyes met and instantly my son’s smile was replaced with teary eyes. His voice was shaky as he shared that he had felt angry, scared and confused. You might be thinking that my son should have some sort of consequence for this kind of behavior. Clearly it’s not acceptable to just let this kind of thing slide. In that moment though, I didn’t talk to my son about consequences. Not Using Consequences Doesn’t mean Your Child “Gets Away” with misbehaving. Many parents believe it’s necessary to make children feel badly about their behaviors; that without consequences children can’t learn responsibility. Dr.Laura Markham, author of Peaceful Parent Happy Kids, explains that we often think pointing out blame is doing something positive—holding someone accountable, teaching responsibility. But kids who grow up in a household where blame is a way of life are more defensive, more inclined to watch their back, and more inclined to blame and attack, than to take responsibility. How often do you use consequences with the well-meaning intent to teach responsibility? To encourage your child to understand their mistakes, misbehavior and shortcomings? If you think this is necessary, you are not alone. Most parents believe that punitive consequences are a teaching tool. Kindness and respect are not rewards for bad behavior, they are necessary for the strong connection with your child that creates change. My child had just openly admitted to hurting someone, so this approach can’t possibly be good right? Well, positive parenting is not about finding the fastest tools for raising flawless kids. There is no single solution to misbehavior that makes children perfect because as children grow, they will make mistakes, misbehave, hurt, test limits and push boundaries. This is exactly why children must have loving, respectful guidance so they can trust themselves to be capable of doing better and better. On that day, feeling hurt and scared my son made a regrettable choice, but he also recognized it and came to me for guidance. Many children that experience punitive consequences don’t dare to speak up when they make mistakes. Traditional punishment and “discipline” techniques often focus on making a child feel badly about themselves. A lecture about how hitting is wrong, grounding my son or taking away his screen time might tick off the boxes on a traditional approach to what happened that day. What would my son learn by sitting around after being yelled at or grounded for hitting his classmate? Not using a computer for the afternoon can’t teach your child how to step away from a conflict. Not watching TV does not teach self-regulation skills. Skipping baseball practice doesn’t teach a child how to make amends for a mistake. Doesn’t it make more sense to guide children towards a solutions? A way to make amends? A way to understand his own behavior in order to make a better choice the next time around? Most of the time, consequences are punitive and keep a child feeling upset, resentful and disconnected from you. Instead of thinking about how to solve a problem or change their behavior, the child now feels incapable and badly about themselves. Such feelings do not create opportunity for reflection and learning. While dealing with defiance or lack of cooperation is difficult. And children most often misbehave when they are already feeling disconnected, bad, tired or overwhelmed. On that day, my son already knew that what he did was wrong. He was so certain it was wrong, he made sure to tell me about it as soon as he saw me. There was no lying or hoping I would never find out. There was honesty and an attempt at taking responsibility for his actions. Discipline that is effective helps your child find their way back to feeling well so they can behave well. Help your child feel safe coming to you, no matter what they have done. Remember that growing up and behaving well takes practice and patience. Set clear expectations and follow through with what you say. Use discipline strategies that are respectful and that promote learning. Substitute punishments with solutions that help your child do better. Replacing punitive consequences with respectful guidance is a process and it take time. It recognizes that children need help, boundaries and clear expectations to know how and when to take responsibility for their actions. If you are wondering how to substitute consequences, begin with the end in mind. Model respect and kindness, offer guidance and take time to connect with your child each day. Most of all trust that your child is ready and able to do better with your loving guidance. Ariadne is a happy and busy mama to three children. Ariadne has a M.S. in Psychology and is a certified Positive Discipline Parenting Educator. As a parent coach, she specializes in helping families bring more cooperation and calm into their homes. She lives on top of a beautiful mountain with her family and one cuddly dog. 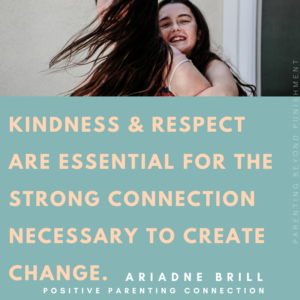 Connect with Ariadne via the Positive Parenting Connection Newsletter, Facebook Page or Twitter.